From Muhammad ibn ‘Abdillah, the Prophet and Messenger of Allah, to Abraham, the Patriarch of Jerusalem, and to the Armenian Bishops of Damascus, and those who are found in other Muslim territory, and to those who depend upon them, namely, the Ethiopians, the Copts, and the Syrians, who inhabit Jerusalem: I have granted them their convents, churches, schools, residences, and fields. I, the Messenger of Allah, with Allah as my Witness, and with the conscious witness of all people, men and women, who are found here, have promised and granted [them] the churches located in Jerusalem, the Church of the Holy Resurrection, and the Cathedral of St. James in the southern part of the Holy City, which is located next to the Monastery of Zion. I have also given them the Mount of Olives Monastery, the Chapel of the Prison of Christ, the Church of Bethlehem, and the chapels of St. John of Samaria [Nablus], the oratories located behind the sanctuary of the Holy Resurrection, and the totality of the upper and inner levels of the Golgotha and the Tomb of Christ where the eternal light shines, all the places of religious pilgrimage, as well as the mountains, the valleys, the residences, and their acquisitions; I have granted them with the witness of Allah, the Messenger of Allah, and all believing Muslims (Morrow, vol. 1, pp. 452–53). 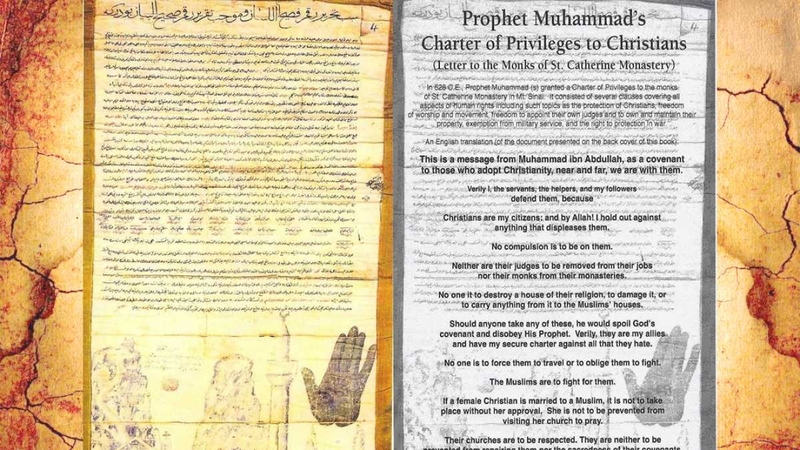 If I repeat the protections provided by the Prophet (pbuh) over and over again, I do so for the same purpose that he did: for emphasis, and to demonstrate that the protections in question were not limited to a single community, were not limited to a certain geography, and were not limited to a certain period of time. They are universal laws, principles, and rights. They apply, not only to Christians, but to Samaritans, Jews, and Zoroastrians as well. In the Covenant of the Prophet Muhammad with the Samaritans, the original of which was preserved by the followers of Moses until the 20th century, the Messenger of Allah (pbuh), states concisely and definitely that, “I, Muhammad ibn ‘Abdillah ibn ‘Abd al-Muttalib, have commanded that a covenant of protection and security be written for the Samaritan community for their persons, their children, their property, their wealth, their places of worship, their financial endowments, and to be binding in all the provinces and places in which they reside. We also pledge to behave with them and the people of Palestine in the best possible manner” (Morrow, vol. 2, p. 527). And what about the Jews? It is exactly the same. As the Messenger of Allah (pbuh), says in the Covenant of the Prophet Muhammad with the Children of Israel, known also as the Treaty of Maqna, “Yours is the safeguard of Allah and that of His Messenger with regard to your persons, belief, and property…” (Morrow, vol. 2, p. 288). But what about the Zoroastrians? Some Persians might ask. In the Covenant of the Prophet Muhammad with the House of Salman, which is found in Abu al-Shaykh’s Tabaqat al-Muhaddithin and Abu Nu‘aym’s Akhbar Isfahan, the Messenger of Allah (pbuh) states that “This is a writing for the people of the House of Salman. They have God’s protection and my protection of their blood and property” (Morrow, vol. 2, p. 405). Property is property. It includes all kinds of property. It includes personal property. It includes historical sites. It includes Persepolis and other such places. Such world heritage sites must be protected. And consider what the Messenger of Allah (pbuh) has to say in the Covenant of the Prophet Muhammad with the Parsis, “Their hands shall be free in building fire temples, administering them, and spending their wealth… They shall be granted exclusive privileges from among the various sects protected” (Morrow, vol. 1, p. 527). The question begs to be answered. If the Messenger of Allah (pbuh) was so adamant about protecting the places of worship of Christians, Samaritans, Jews, and Zoroastrians, why on earth would he command Muslims to destroy Islamic heritage, masjids, graveyards, tombs, mausoleums, and shrines? Why would he want Muslims to destroy their own religious, historical, cultural, and archeological sites? He would not. It makes no sense. If the lives and property of non-Muslims are so sacred, so are the lives and property of Muslims. As we have seen, the Qur’an, the Sunnah, the Sirah, and the letters, treaties, and covenants of the Prophet Muhammad (pbuh) are testimonies to the tolerance of Islam and its commitment to protect the lives and property of both Muslims and non-Muslims. Time and again, we see that the protection of people and their property is inseparable. They always go hand in hand. Is this the life, liberty, and property presented by John Locke, the Founding Fathers, the Declaration of Independence, the Bill of Rights, and the Universal Declaration of Human Rights? No. No. No. That’s the life, liberty, and property presented by the Prophet Muhammad (pbuh). In other words, all of that is from Allah (swt). Respecting, maintaining, preserving, and protecting sacred and world heritage sites is a sacred duty. May the peace and blessings of Almighty Allah be upon the Prophet Muhammad and his family.